Contact Sheet. Folded up (left) and in the pouch. 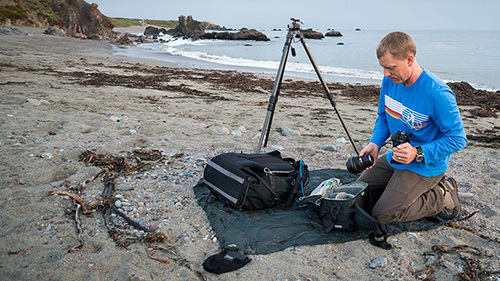 Made from 30D Ripstop PU and nylon mesh, the lightweight and waterproof tarp addresses what the company called the Number One need of outdoor photographers, which is "a way to spread their gear out on the ground without it being exposed to the elements." Like any blanket, we suspect it works well the first time you use it. But you'll have to designate a clean side distinct from the dirty side and make sure the dirty side doesn't soil the clean side for it to be useful a second time on location. Apparently you can just hose it off when you get back to civilization. Around here though, it would help if it came with four stakes to keep it from flying off with our gear. The winds have been America's Cup-class all summer. And we'd hate to have to weigh it down with a few lenses. At Work. Seems like the wine and cheese is missing. SANTA ROSA, Calif. -- MindShift Gear has released its multi-purpose Contact Sheet. Designed for photographers who work in wet or dirty environments and who need a clean, dry work area, this 3.5' x 5' ultralight, waterproof ground tarp provides a barrier from the elements and stuffs into a mesh pouch for easy transportation and storage. The Contact Sheet solves one of nature and outdoor photographers' biggest headaches, which is how to create a safe work area when operating remotely in the out-of-doors. Made of a mixture of 30D Ripstop PU and Nylon mesh, it can easily be spread out and valuable electronics gear laid on it safe in the knowledge that it is protected from the elements. 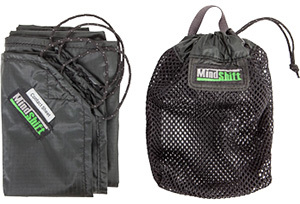 MindShift Gear is a group of professional photographers and designers committed to conservation of our natural resources and global environment. Founded by the creators of Think Tank Photo and conservation photographer Daniel Beltr , MindShift is dedicated to building carrying solutions for those who are passionate about experiencing the natural world. Their slogan, "Engage with nature," challenges people to not only become involved in outdoor activities, but to create a conversation about nature and our relationship to the environment.